Ground floor equals First floor in this context? Fortunately, she had bragged to everybody about her ducky first-floor apartment in the perfectly darling three-story red-brick...When the clicking in the lock started, he jumped forward against the door. He got inside fast, closing the door behind him. A bulb in a lantern hung from the hall ceiling on a chain seemed to give a monstrously bright light. There was nobody on the stair, which went up ahead of him along the left wall. A door opened down the hall in the wall on the right. He went toward it swiftly, on tiptoe. I have a question. In one part,it is stated her house is a 1st-floor apartment. 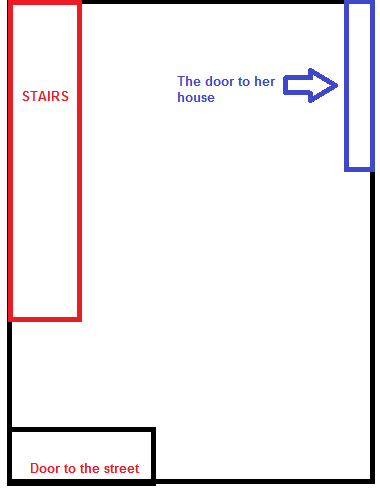 In the other, it seems that her house is just on the ground-floor that is on the very floor that the door to the street opens and he has not gone upstairs. Would somebody please shed light on this? What's more, What does down the hall mean? Is down a preposition here and means at the end of the hall? Or it simply says the door is somewhere on the right wall? Based on the text I have drawn a plan, is this right? Given that your source says that it was published in The New Yorker, I imagine the author is American. In Europe, floors are described as follows: ground floor (street level), first floor (first floor above street level), second floor, third floor, etc. However, in America, they call the street-level floor the first floor. So if the publication is American, then "first floor" will be the ground floor. As for "down the hall" it means "along the hall" in this context. So it's further along the hall, not necessarily at the end. It could be at the end, but all it says is that it's closer to the end than the current position is. Doors 1-3 could be described as "down the hall" from a person standing at X. Door 5 is right next to him so it wouldn't be described as "down the hall". Door 4 probably wouldn't be described as down the hall since it's a bit too close, but it could be. "Down" as in "down the hall" is a very common and correct usage. It is also meaningless. Sometimes "down" can refer to moving to lower elevation (down the hill), it can also refer to going south (an American goes "down" to Mexico), but just as often up vs down is completely arbitrary. There is nothing to suggest which direction someone is going when they go "down the hall". The use of "down" means nothing regarding whether the final destination is on the left or right side, or in the middle in the hall. "Down the hall" can mean just a few feet down a long hallway, or it can mean all the way to (either) end. I'm unclear as to what exactly you're asking regarding "ground floor" VS "first floor", but I can tell you that those two terms are synonymous and interchangeable. The description in that paragraph of the building is very unclear. I'm not sure what the author means by a stair that runs along a wall, that makes no sense to me. If he had used the word "staircase", then I would say that your diagram looks exactly right. Just FYI, a "house" generally refers to a single family dwelling. Where you use the word "house" in the question, "home" would be a better choice of word, or apartment. The lot is cast into the lap - Lot equals dice? “is” and “was” in the same phrase: What is the tense? Past or present? What does “ground-covering gait” mean?